When I moved back to California from Italy, I couldn’t bring my beloved, but ancient Elna sewing machine. 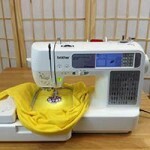 I wanted to get into machine embroidery, but I also needed a sewing machine. The budget was tight because of the move. 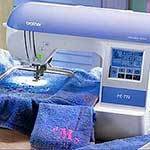 So I opted for the smaller Brother SE400 which is a combination sewing and embroidery machine. If I had had a larger budget, I would have bought the Brother PE770 instead of the Brother SE400. I love my SE400, but sometimes wish for something larger, and I would love to transfer files via a USB stick. It’s still on my wish list though. This video from HSN demonstrates the features, LCD screen and how easy the Brother PE770 embroidery machine is to use with the LCD touch screen. They also show some embroidery projects and talk about the advantages of the USB Port which takes a thumb drive so you don’t need to have your computer next to the embroidery machine. At the time of this video, HSN was offering the Brother PE770 for $799.95 + Shipping and Handling. This is way more than Amazon.com’s price. HSN does offer a five-month payment plan. You’ll pay more in the end, but if you need a monthly payment plan, click here to see HSN’s current offer. Click here to see today’s price on Amazon.com. 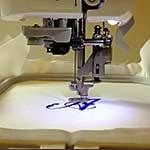 I’m just starting to think about investing in a machine with an embroidery feature. Your pages on this and the SE400 were a massive knowledge injection. Thanks so much for taking the time to put them together.